1. Take 120 g of 2-nitro-1,4-phenylenediamine, add 12 mL of glacial acetic acid, 1200 mL of water, and 1200 mL of methylene chloride. Raise the temperature to reflux and dissolve all the starting materials. Add 2,5-dimethoxy 232.8 mL of tetrahydrofuran was refluxed for 6 h and the reaction was monitored by TLC. The reaction solution was cooled, and the pH was adjusted to 7-8 with 5% sodium hydroxide solution. A large amount of solids precipitated, which was filtered off with suction, and the filtrate was separated. The dichloromethane layer was washed with saturated brine and dried over sodium sulfate. The aqueous layer was extracted with 1200 mL of dichloromethane. The cake was added with 1000 mL of dichloromethane, stirred, and suction filtered. The organic phases were combined, washed with saturated brine and dried over sodium sulfate. The desiccant was filtered off and concentrated to obtain the first intermediate 2-nitro-4-(1H-pyrrol-1-yl)aniline. 2. Take 120.0 g of the first intermediate obtained above and 348 g (1.182 mol) of SnCl2·2H2O into 1200 mL of ethanol, and heat to reflux for 1 h. The reaction is monitored by TLC. Ethanol was distilled off under reduced pressure. 1200 mL of water was added to the residue, and the mixture was adjusted to pH 9 with 5% NaOH under stirring. 1200 mL of dichloromethane was added, stirred, filtered under suction, and the aqueous layer was extracted once with dichloromethane. The organic layers were combined, washed with saturated brine and dried over magnesium sulfate. The desiccant was filtered off and concentrated to give the intermediate 4-(1H-pyrrol-1-yl)-1,2-phenylenediamine as the second step. 3. Take 90.0 g of the second intermediate obtained above, 20.8 g of NaOH, and 900 mL of methanol. After dissolution, add CS231.5 mL. Heat and reflux for 2 h. A large amount of yellow solids are generated. TLC monitoring is complete. 300 mL of water was added and the pH was adjusted to near neutrality with acetic acid. The methanol was distilled off and suction filtered to give a third intermediate 5-(1H-pyrrol-1-yl)-2-mercaptobenzimidazole. 4. Take the third step intermediate 100.0 g obtained above, and dissolve the NaOH 37.1 g in 1000 mL of methanol and heat it to 50° C. to dissolve it. Take 4-methoxy-2-chloromethyl-3-methyl. 96.5 g of pyridine hydrochloride was dissolved in 1000 mL of methanol, and the solution was added to the reaction solution. After refluxing for 1.5 h, a large amount of yellow solids precipitated and the reaction was monitored by TLC. 2000 mL of water was added to the reaction mixture, stirred for 30 min, suction filtered, the filter cake was washed with water, and the target compound was dried to give 5-(1H-pyrrol-1-yl)-2-[[(4-methoxy-3-) Methyl-2-pyridyl)-methyl]methylthio]benzimidazole CAS number 172152-35-1. 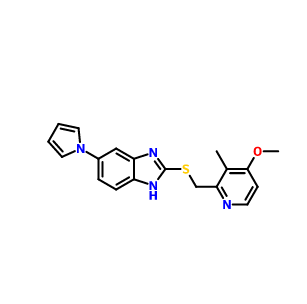 Looking for ideal Intermediate of Llaprazole 172152-35-1 Manufacturer & supplier ? We have a wide selection at great prices to help you get creative. 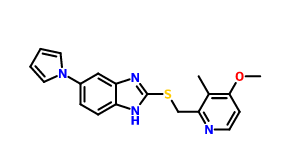 All the CAS 172152-35-1 are quality guaranteed. We are China Origin Factory of CAS Number 172152-35-1. If you have any question, please feel free to contact us.